On the most beautiful October 23rd day at 10:00am, at Hiles Blvd. 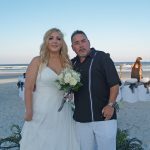 beach in New Smyrna Beach, Kyle DeRosa and Crystal Hollifield got married in the presence of their two children, Ashlee and Ayden and family/friends. This morning was full of joy and sheer excitement as well as one of the most photogenic families ever. The huge flock of gulls made our photography fun and memorable. Working with these beautiful families never gets old. Did I mention that the kids were adorable and so well behaved! The couple selected the Sara two post bamboo arch with light pink and white tulle, a sand ceremony with pink and white sand and standard photography which yielded amazing photographs. Too many great ones too choose from!